Log based change data capture keeps Redshift up-to-date so it can be queried near real time. Flexible architecture allows data transfer to Redshift through Amazon S3 or streamed through Amazon Kinesis. • Website clickstreams, financial transactions, social media feeds, IT logs, and location-tracking events. • Integrate various combinations of data sources inside Redshift through a simple drag and drop user interface without the need for any coding. Includes a rich library of over 100 predefined common data transformation functions optimized for Redshift. • Automatically process data through Hadoop on EMR and then directly transfer the results into Redshift. A rich library of predefined functions written in Map Reduce code allows users to easily join different sources, perform transformations & summarize selected data. "Amazon Redshift provides easy-to-use, scalable and sub-$1000 per terabyte per year data warehousing along with robust Big Data capabilities. 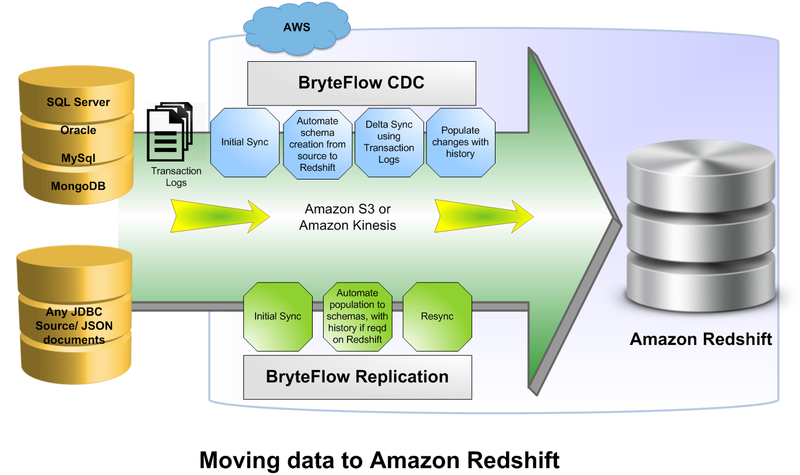 Together, Bryte and Redshift significantly lower the cost and effort associated with managing large data volumes and Big Data, making it possible for clients to uncover new insights and analytics than ever before and ultimately make better decisions to grow their businesses." "We provide an end-to-end solution to automate the transfer and loading of data into Redshift. In addition, we provide a comprehensive set of ETL/integration and Big data integration capabilities through a modern ELT architecture to transform and integrate data from multiple sources directly inside Redshift. We also provide a broad set of capabilities to leverage technologies like EMR and Kinesis with Redshift to help clients create customized business intelligence and reporting solutions." Automate data transfer to Redshift from SQL Server, MySQL, Oracle, MongoDB, etc + real-time sync through log based change data capture. Automate ETL using a drag and drop interface. Our free trial includes complimentary support.